Technology Tools Below are a collection of technology tools that I have used in the past that I think would be excellent to use in any subject at the Pierce School. You can scroll down and browse through the examples and links below. Please feel free to contact me if you want to learn more about any of these tools or you think you would like to plan a project or lesson with this technology. I can meet with you personally to show you the tool, create a video for you and your students (like the Memorize.com example below), or prepare a short tech lesson for your class in the computer lab to explain how the technology is used. Finally, if you hear of another tool that you are interested in, but may not have time (or the 'technical-inclination') to explore, please let me know! Viewpure.com allows teachers to play YouTube videos to their students without pop-up ads, comments, and other unwanted content. First, find the video you'd like to play on YouTube, copy the link, and then go to Viewpure.com. Paste the video link in the box at the top of the page and click 'Create'. Glogster is a website where students and teachers can create their own interactive poster on any topic they choose. Posters can include images, text, music, video, hyperlinks, and more. Glogster EDU is the sister site of Glogster, created specifically for teachers and students. Once students are finished, they 'publish' their glog (making it either public or private) and they can share their glogs with others using a URL that is provided. Glogs can also be presented on individual computers or on SMART Boards. Glogster is great for use in schools because it's free, it can run on any computer, and it is easy for teachers to access and organize. 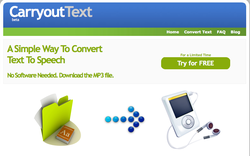 Carryout Text is a site that serves as a simple way to convert text into audio. The text is converted into an MP3 format. This makes it very feasible to take lectures notes that you have created for students and make it into an audio file that students can listen too. It could be very beneficial in creating a way for students who struggle with reading to have audio to follow along with. Voki is a website that allows students (and teachers) to create their own free-speaking avatar. Click here for an example where a middle school class in Milwaukee created avatars of George Washington and conducted a 'press conference'. The avatars only take a few minutes to create. Students can record their own voices for their avatars (using microphones in the language labs) or they can use the text-to-speech feature on any computer. Use for a history project, science project, geography project, and more! Polleverywhere.com is a free website that allows students and teachers to create their own live polls. Students can answer polls via the internet, text, and Twitter. For example, when you're in the computer lab, create a quick poll to start of the class discussion. Polls can be created using various designs and formats. Students and teachers can download poll results to Power Point presentations. Click here for a video introducing Polleverywhere.com. Prezis are more modern, free-form version of a Power Point. They are a fun way to present information in a creative and different way. 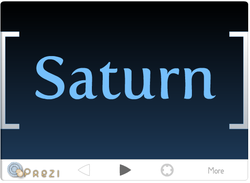 Click here to view my Prezi example. Click on the arrows below the window to travel through the presentation. A VoiceThread is a collaborative, multimedia slideshow that holds images, documents, and videos and allows teachers and students to navigate through the show and leave comments in a variety of ways, including text, voice and video (via webcam). Creators can share their VoiceThread with others and encourage them to comment on each slide, leading to great collaboration and idea sharing. Click here to see a VoiceThread created by a teacher which provides a great example of how teachers can use VoiceThreads with their students. The links below are further examples of how this technology can be used in a classroom, including a Poetry example, a Science Project example, and more.